Have you noticed that many native spring wildflowers are in peak bloom now? Take a hike in any forest and you are likely to see them. Mid April to Mid June is a peak time for woodland wildflowers. 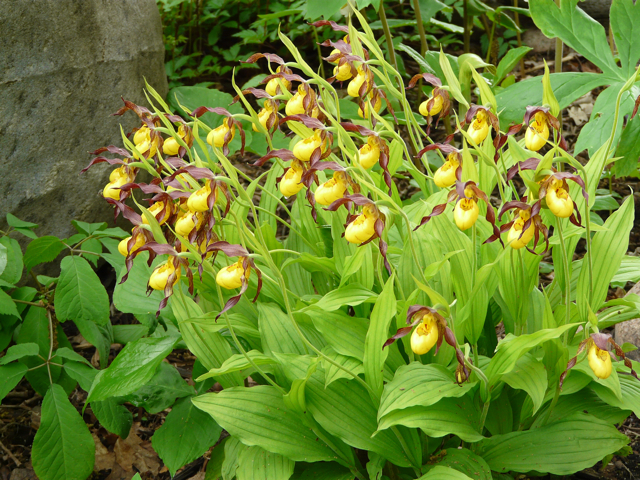 Most spring wildflowers grow in rich woodland soil. They thrive in the filtered light of the woodland spring, and then die back in June. After the dark months, seeing a spring wildflower can give joy to a winter’s heart. Get to know these jewels that are growing in your neighborhood. What to do: Click on the “Start” button below to take the Wildflower Quiz. Read the description of each plant and then guess its name. 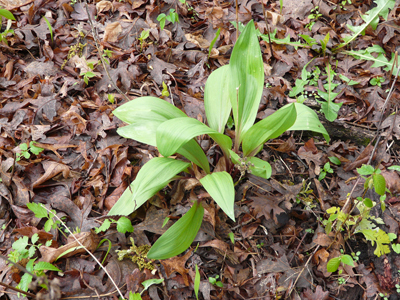 One of the earliest plants to be seen in the woodlands (early April in MN). The plant is in the onion family and it blooms after the leaves die back. The bulb is edible and was used by Native Americans. By early May the leaves begin to die back. What is its name? 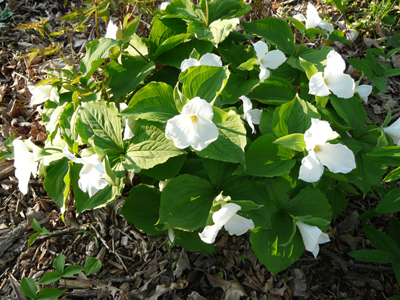 This plant blooms in mid April and grows in a clump which gets larger each year. It grows up to 18 inches high, and is in the lily family. What is its name? 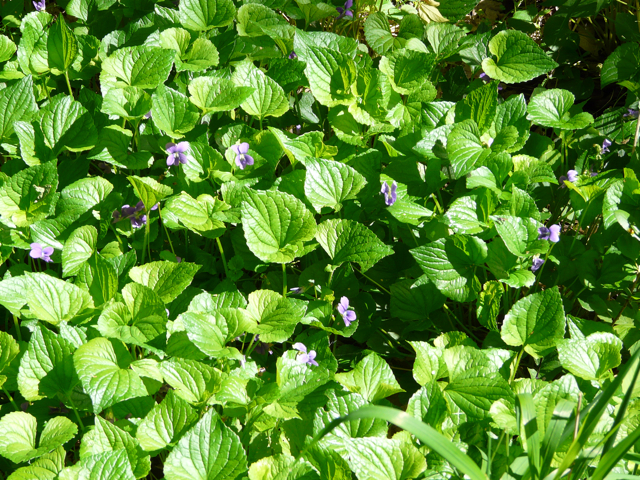 This plant is found in woodlands, and forms a ground cover that spreads quickly. It blooms in late April, and the flower is on the ground. This allows ants and other crawling insects fertilize the the plant, since there are usually very few flying insects in late April. What is its name? 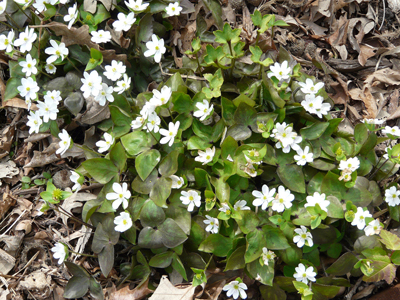 This low growing plant blooms in mid-April and is in the buttercup family. Its flowers are pinkish and the plant can spread over a wide area. Its leaves look like a rabbit's foot. What is its name? 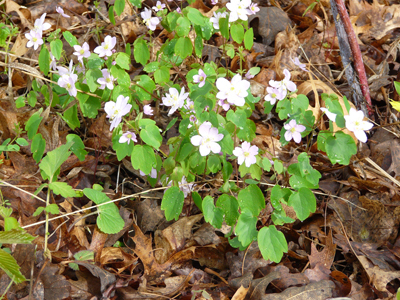 This woodland plant is one of the first wildflowers to bloom. It is less than a foot high, and its flowers can be white, blue or pink. Its name refers to the shape of the leaves which have 3 lobes (similar to a human liver). What is its name? This beautiful plant gets its name by having three leaves and three petals on its flowers (Part of the plant's name means three). The plant spreads by underground rhizomes. Large clumps of this plant can be over 25 years old. They are members of the lily family. What is its name? An early spring blooming wildflower (Mid April). 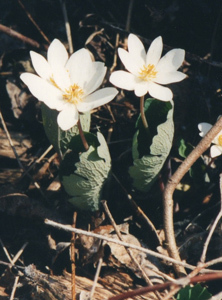 Besides the beautiful flower, the leaves are unique shape and can be seen through May. 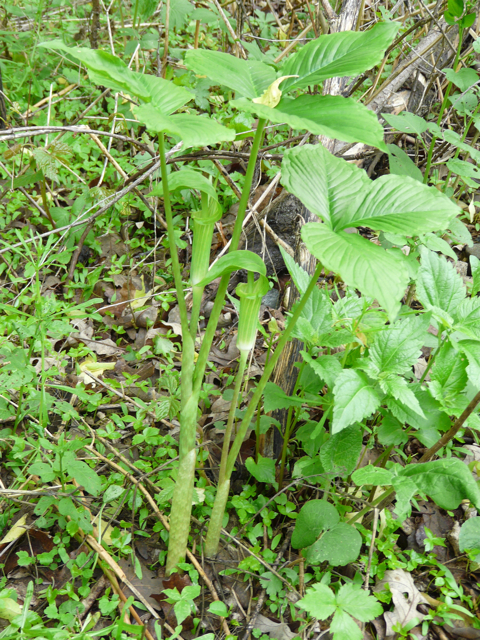 Like many other woodland plants, it spreads by rhizomes and if undisturbed will form a dense mat of plants covering 200 square feet or more. The rhizome is orange in color and Native Americans used the root as a dye. What is its name? This wildflower blooms in early May. Its genus name is Aguilegia (similar to the Latin word, aquila, which means eagle) and probably refers to the spurs on the flower being similar to an eagle's claws. This plant spreads primarily by seed. Native Americans ground up the seeds and used them as a love potion. What is its name? This wildflower blooms in early May. 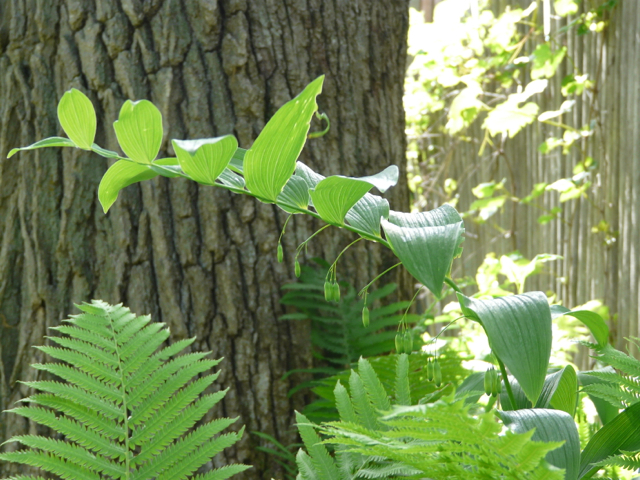 It can up to 2 feet tall and has 3 leaves. It gets its name from the club-like object that is enclosed in the narrow funnel. This plant spreads primarily by the red seeds that ripen in the fall. If the root is eaten, it causes a burning sensation described as "a mouthful of red hot needles". What is its name? 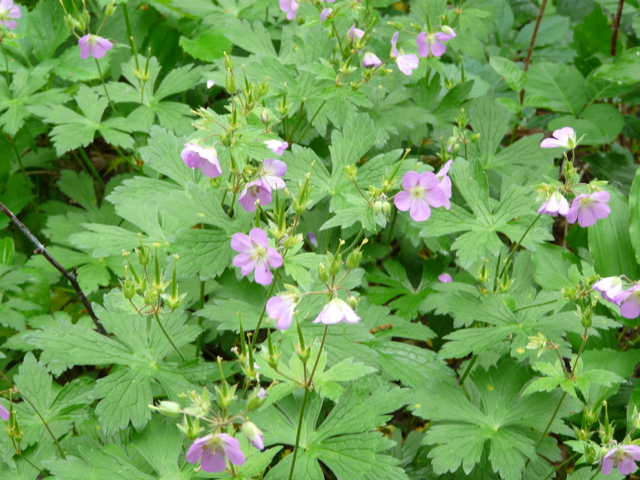 This wildflower is one of the most common and well-known wildflowers in the woods. 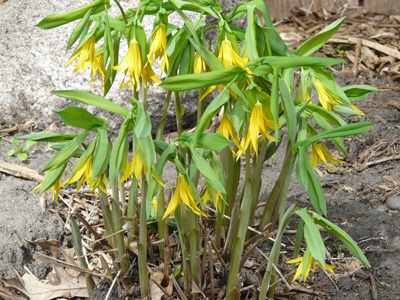 It is low-growing and blooms in late April. 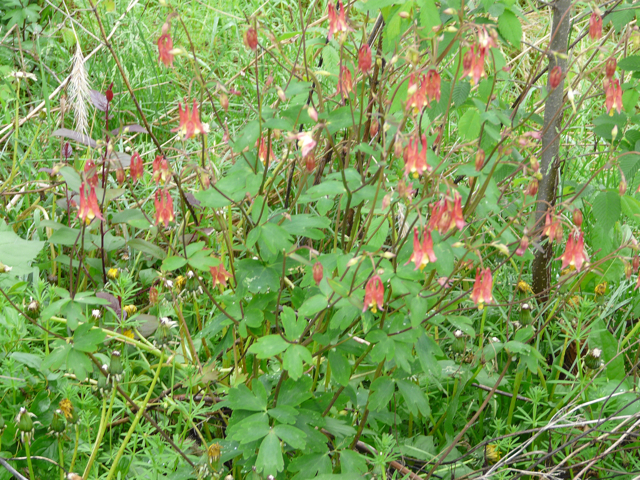 This plant spreads primarily by rhizomes and/or ground runners and can form a dense mat of plants. During Roman times this plant was used to treat headaches caused by hangovers. What is its name? This wildflower blooms in May and gets over two feet tall. 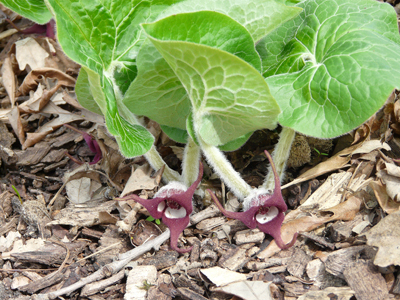 The plant has also been called “crane’s bill”, because the seed capsule looks like a bird beak. Native Americans brewed a tea for relief from toothaches. Early settlers used the leaves and roots for tanning hides. What is its name? This plant blooms in May and is 2-3 feet high. The flowers hang from its graceful stem. Its name refers to the knobs on the roots. The root is used by herbalists to reduce inflammation. 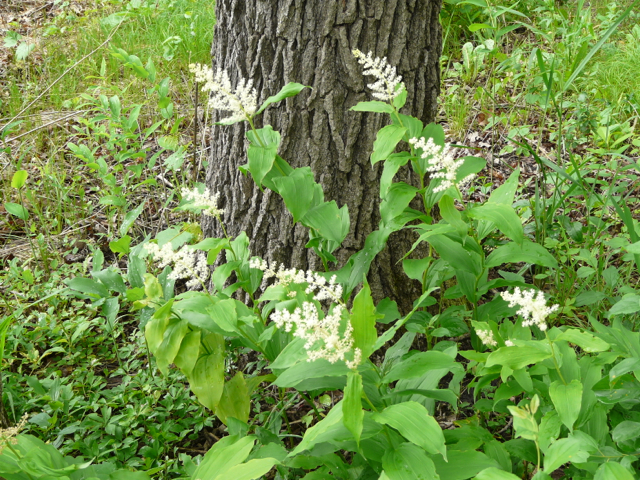 Early settlers also, used the root for a number of ailments including: treatment for poison ivy and kidney troubles. What is its name? This wildflower blooms in May and grows to 3 feet high. It is similar to another flower in the quiz except that its flowers are found at the end of its stem. The plant had a number of uses by Native Americans including: The roots were used to stop bleeding; a tea was made out the leaves as a contraceptive. What is its name? You need more practice! Turn off the TV and get out in the woods!" "Keep trying! More time in the woods, and you'll call these plants 'friends'!" "Not bad! Some more time out in the woods, and you'll know these plants well! " "Good work! Get back out in the woods and see if you can find the ones you missed." This is so awesome! I loved taking the test. I did not so bad…but what a great educational tool!!! I look forward to working with you at RidgePointe!! Fun quiz, thanks Larry. You inspired me to get out there! 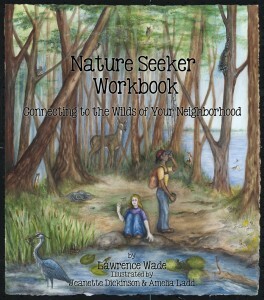 Love to learn about nature! Anxious to go out for a walk tomorrow and try to figure out these wild flowers!!! GRACIAS Larry! Fun quiz! I didn’t get more than a few right the first try, but then again, we don’t have a lot of these plants in Alaska. Pretty pictures!